Four months after meeting, one June day back in the early 90s, Ben and his wife Christel tore down their first house together. With some weekend help from a few friends armed with little more than sledgehammers, the couple took their Arlington, Virginia, fixer-upper down to its foundation, and built a completely new home in its place. The success of your first fixer-upper often determines whether or not there will be a second. For Ben and Christel, their success prompted Ben to pursue building full-time. It wasn’t all by chance, though. Ben and Christel shared common ground in real estate development – Ben in residential, and Christel in commercial – and Ben’s grandfather, a career construction man, may have helped inspire Ben at an early age. After ten more years in D.C., the couple moved to Atlanta in the early 2000s where they took on everything from Section 8 housing to luxurious Buckhead area projects. 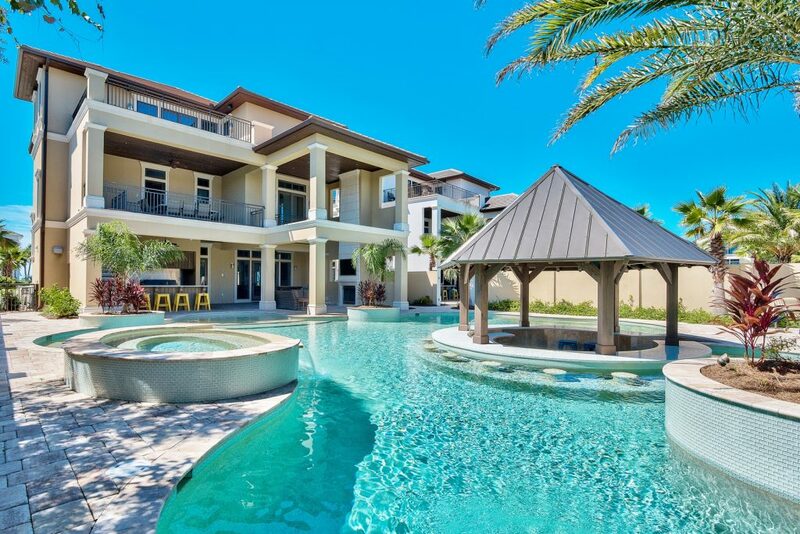 All the while, Ben and Christel paid visits to the Destin area – a place Ben came to know during his tour at Tyndall Air Force Base in nearby Panama City, Florida – and began investing in real estate there. Homes in Atlanta were being built to be lived in. Renting a home – even long-term – carried a stigma, and with it, the potential for depreciated value. The couple quickly noticed quite the opposite in the Destin area, where the short-term rental market was shaping homes being built at the beach, which occasionally forsaked function (and style) for capacity. Each new project Ben and Christel took on together was an opportunity for the couple to refine their product and deliver more of what buyers in the market were looking for. And, as their business model continued to change, from fixer-upper to a more ground-up approach, they welcomed aboard Christel’s brother, Chad Wandrick. A licensed general contractor, Chad, along with his family, live a few doors down from Ben and Christel, who made Destin their home in 2010. Now, Ben’s penchant for functional planning, Christel’s eye for design, and the team’s willingness to try something new is taking shape in an entirely new way – one that is redefining a prominent part of the Destin landscape. Artistic rendering of a finished home at Park Row at Crystal Beach. Many buyers in today’s market are looking for legacy homes – properties that accommodate stays with extended family, and that will remain in the family for years to come. These homes in particular are built to stand the test of time and changing tastes. Ben and Christel’s team is creating seven such homes in their new Park Row at Crystal Beach community. Located on Hutchinson Street – Destin’s most prominent thoroughfare leading those arriving from the Mid-Bay Bridge to Scenic 98 and the Gulf of Mexico – Park Row at Crystal Beach candidly marks their arrival somewhere special, with its Alys Beach-inspired architecture and truly transformative street presence. The team ambitiously worked to install underground utility service for the entire street, leaving nothing to detract from the statement community. One of the challenges with the Park Row project – as is with every other – was how to maximize the homes’ amenities given the relatively limited amount of space. Balancing that limited space with the density the team believed necessary to achieve the scale of a small community came with some tireless planning alongside Architect Chris Stoyles of Archiscapes. We think they knocked it out of the park. Amenities are important for the sometimes two – or three – families who have come together to enjoy one of these legacy properties. Unlike so many of the beach homes Ben and Christel encountered their first few years visiting the Destin area, their homes deliver. Larger homes with seven or more bedrooms sleep a lot of people, but they aren’t always able to feed a lot of people – or at the very least, won’t allow everyone to dine together. And, who wants to start their family vacation fighting over the one and only master bedroom? Ben and Christel solve for these issues with multiple master bedrooms, uniquely designed private baths, as well as oversized kitchens and dining areas with seating for 20 or more. The 80,000 gallon pool by Watermark located at 3463 Scenic Highway 98 in Destin. 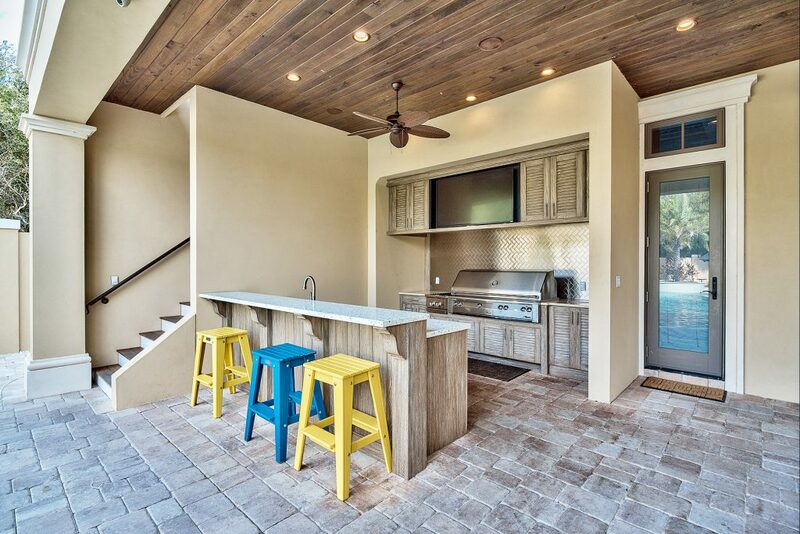 The outdoor kitchen located at 3463 Scenic Highway 98 in Destin. Each floor of the homes the team creates include expansive patios, covered balconies, and rooftop decks, and their pools have become somewhat of a signature feature. The resort-style pools by Watermark are often appointed with swim-up bars, sunning shelves, spas, and summer kitchens. The first home at Park Row is scheduled for completion in early 2019, with two more set to follow shortly thereafter. Starting at approximately 7,000 square feet, the homes at Park Row have been designed around the tenet of long-term sustainability, both in ease of maintenance and overall functionality. 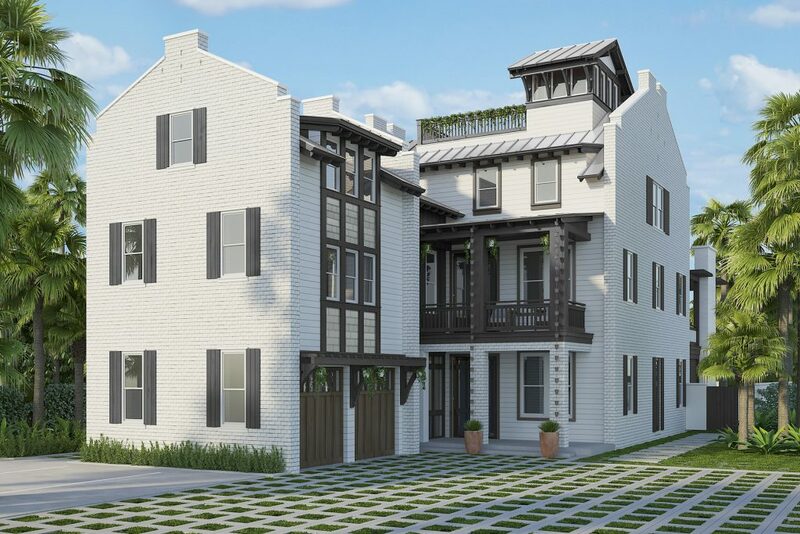 Long-lasting, white-washed brick adorns parapet walls, giving the homes their distinctive Alys Beach-inspired styling; the brick is paired with a mix of low-maintenance Hardiplank and shake siding, which softens the otherwise austere stone surfaces. 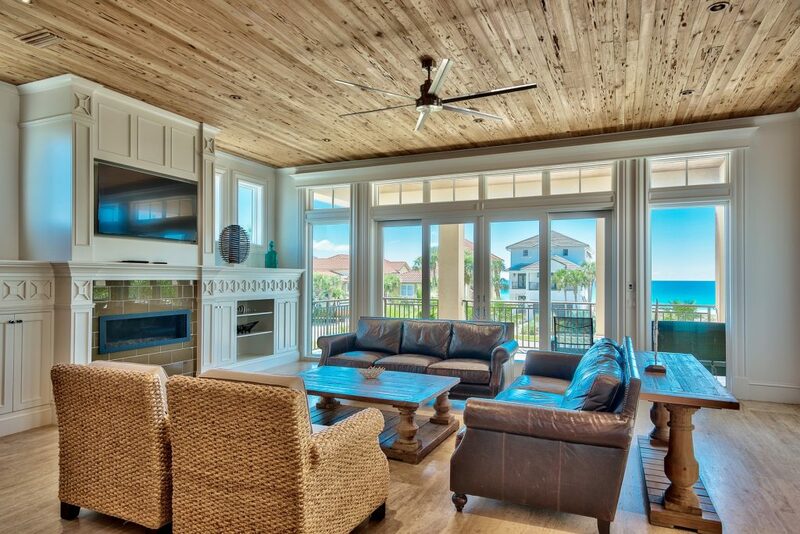 The second-floor living room located at 3463 Scenic Highway 98 in Destin features signature pecky cypress ceiling detail. 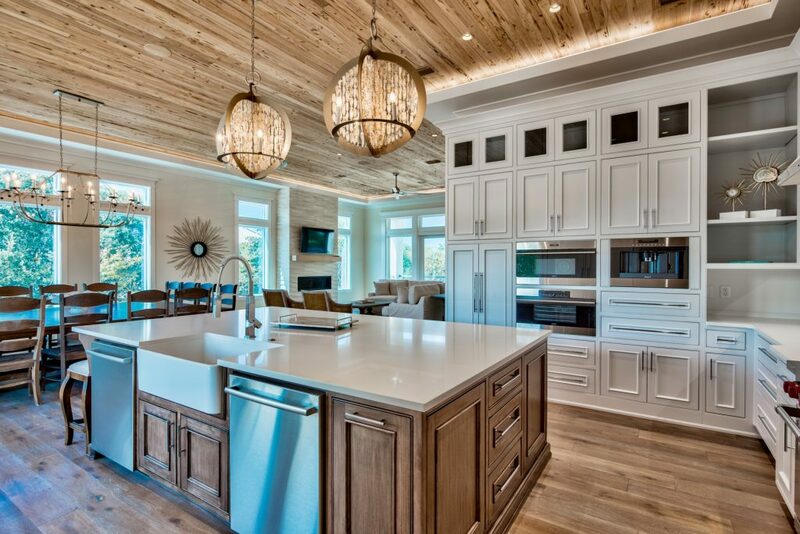 The kitchen located at 35 Camellia Street in Seagrove Beach. Custom cabinets are complemented by a hand-made vent hood by Francois & Co. 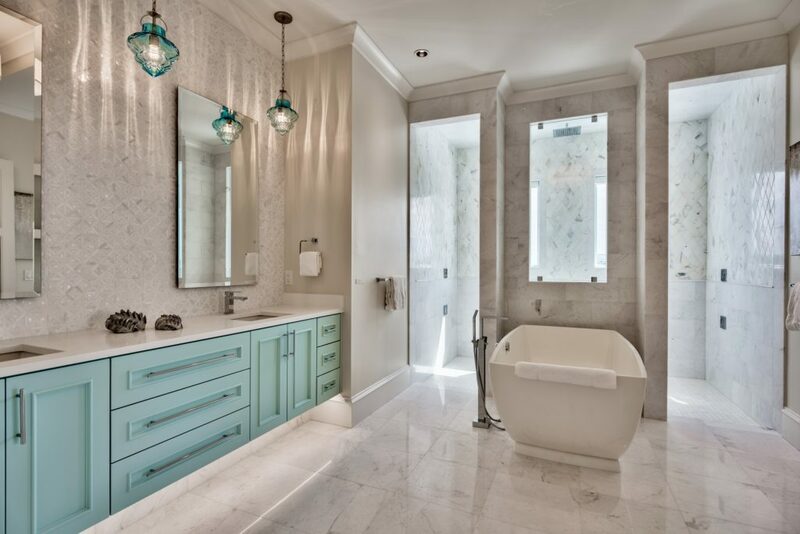 Carefully sourced Calcatta marble graces the floors of the master batha t 35 Camellia Street in Seagrove Beach. 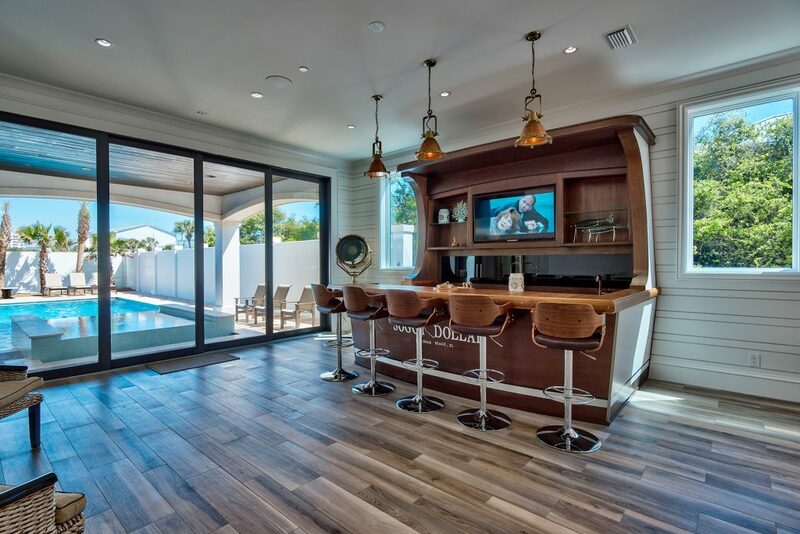 The nautically themed Soggy Dollar boat bar, located at 42 Miami Street in Frangista Beach, opens to a 40,000 gallon pool by Watermark with swim-up bar. Stuccoed masonry courtyard walls reach eight feet high, affording ample privacy to 80,000 gallon, custom-designed pools and adjoining covered living spaces with gas fireplaces, kitchens with built-in gas grills, sinks and refrigerators. Typical of Ben and Christel’s designs, the pools include a swim-up bar with sunken seating and perimeter overflow spa. Overlooking – and accessible from – the pool deck is a second-story sun deck. Located off the homes’ main living area, the deck captures views of the gulf, which only get better from the dual master suites on the third floor, and from the fourth-floor rooftop deck, where panoramic views of Destin unfold. Additional living areas on the first and third floors provide space for guests enjoying these nine-bedroom residences (with Pinterest-worthy bunk rooms) to spread out, or comfortably entertain. Ample parking in the private motor courts and enclosed two-car garages eliminate the shuffling of vehicles – not that you’d need one to enjoy everything Destin has to offer in such short proximity. Park Row at Crystal Beach is within a (street legal) golf cart ride away from Legendary Marine on the Choctawhatchee Bay, iconic local dining at neighboring Camille’s, beach access at the end of Hutchinson Street, as well as Destin Commons – an outdoor lifestyle center complete with Whole Foods market. While the team seeks inspiration at builders’ shows all over the country, a healthy dose of instinct goes into the unique homes they create. They use locally-sourced materials, like pecky cypress for their trademark living room ceilings, along with those from more exotic locales like Greece, where much of their stone is quarried. The team has tried everything from concrete slope sinks to custom glass counters, and luxurious flat panel cabinetry in a contemporary kitchen that frayed Christel’s nerves. It turned out better than anyone expected, by the way. With their array of bespoke finishes and features, one would certainly say that Ben and Christel’s creations are luxurious; but these home’s most lux quality is their overall experience. Curating an experience is the focus for the team’s current and future projects. Having a home at the beach means something different for everyone. It’s an escape from the rigors of urban life, a well-deserved reward, an investment in the future, the beginning of a family legacy, or any number of those things, and it’s the way Ben and Christel’s homes address all of these needs at once that truly sets them apart. As seen in Niche, Fall/Winter 2018.